A multi-generational family vacation in the Caribbean during spring break sounds like a recipe for disaster, and a tacky one at that. Andrew Essex finds the impossible: a perfect island. 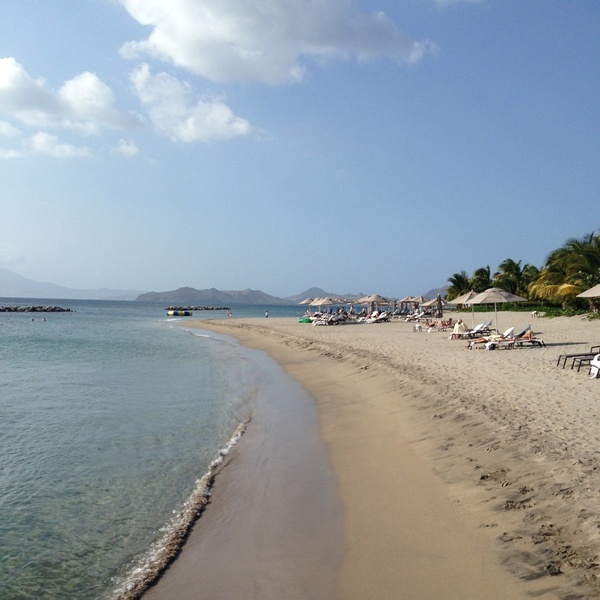 NEVIS, West Indies – There comes a point in one's life — a bittersweet moment that tends to fall between middle age and decrepitude — when the word "vacation," that paradisiacal idea fixe of empty beaches and plentiful cocktails, morphs into "family vacation," which means travelling with a clattering retinue of demanding children and opinionated in-laws. To reach such status in life, to become someone who regularly holidays with a small army of relatives, is certainly a victory of sorts, in the whole "be fruitful and multiply" sense. But good luck finding a resort that can accommodate the needs of the modern extended family, let alone instill a sense of profound sartori in a delicate seven-year-old daughter and lactose-intolerant mother-in-law. I recently had the pleasure of discovering that Four Seasons Nevis is such a place, an epiphany that occurred to me somewhere between arrival and our first contact with a family of Vervet monkeys. But more on them in a moment. One of the great burdens of being a breeder is that your kids are obligated by law to go to school. The fact that most schools schedule spring break at the same time as other schools tends to limit one's holiday options, especially if you must travel like the Clampetts. Those options are further limited if you live on the east coast of the United States, where winter has grown increasingly apocalyptic, and the need to spend spring break in Caribbean succor — ideally without other people's screaming children and water slides — is intense, as is the competition for rooms, not to mention the number of overrun islands and imposters in the hospitality sector. With all due respect, and I say this from experience, Aruba was out. We were in a pinch. We needed the confidence and thread count of a trusted luxury brand, and all the creature comforts and mod cons required to address the requirements of our expansive entourage. We were fortunate to be able to pay, but were interested in the best possible value. Also, edible food would be nice. Maybe a camp in which to deposit the little ones. And a serene adults-only pool in which to deposit the in-laws. It's not easy to wrap this up in one elegant and effortless package. Booking a place can be stressful. The anxiety of whether you've booked the right place can even be more stressful. Such trivial concerns all evaporate as the ferry decelerates and the summit of Nevis Peak appears on the horizon. Yes, you check into this Four Seasons resort via boat, a brisk thirty-minute voyage after deplaning at sister Leeward Island St. Kitts. 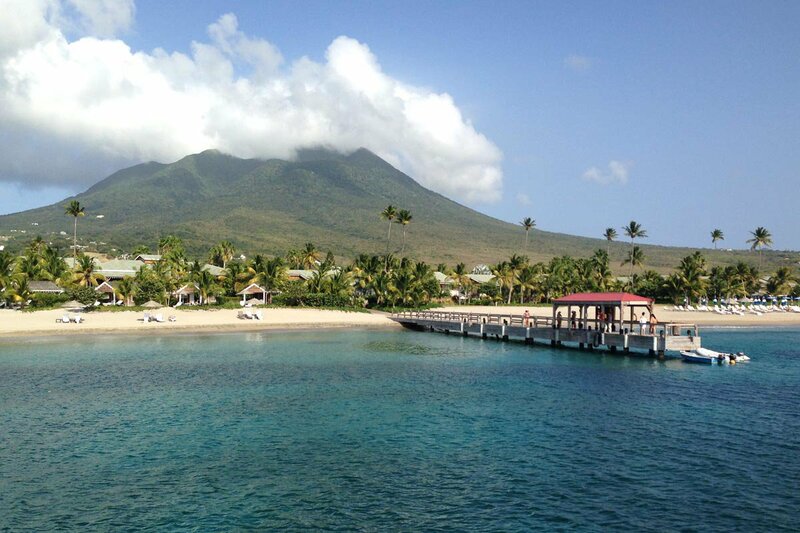 Nevis is the only island resort I know of with such a ceremonial arrival, and it kicks things off on a high note from the moment your flip-flops hit the dock. Nicely fortified by a strong rum punch, which helps quell sea-sickness in everyone, except perhaps the mother-in-law, the kids sugar-rushing from a few glasses of virgin punch, you disembark onto the paradise of Pinney's Beach, a six-mile, white-sand parabola. Like a modern-day Columbus, you have discovered the cure for anhedonia. But that is only the beginning. Shut down by hurricane from 2008-2010 and painstakingly renovated to the tune of $110 million, the property is a perfectly engineered oasis. Everything pleases the eye and also the ear. It is quiet here. You do not hear clichéd reggae blasting. You do not hear loud conversations that you would rather not be privy to. There are three huge infinity pools, spread equidistantly across the expansive property dotted with baobab trees, sea grapes, and hibiscus. If you prefer to vegetate by the beach, as I do, you are greeted daily by the cheerful, polymorphously attentive beach staff. You get to know Marv ("short for Marvelous," she sheepishly explains) who will refill your glass daily with "the ice water of the day" — ginger-spiked, strawberry-steeped, or passion fruit-infused — before you knew you were thirsty. The staff is uniformly exceptional. ("We hire the smile," general manager Sven will later tell me.) In the afternoon, you will nibble a fresh-baked macaroon or bite-size sorbet amuse bouclé. All day, you swim in warm, cerulean water and take your eleven-year-old son and seventy-year-old father-in-law snorkeling right off the beach — gear is always available a few paces away. You will likely float over a sea turtle, eel, or eagle ray, as we did on a regular basis. It's that easy. 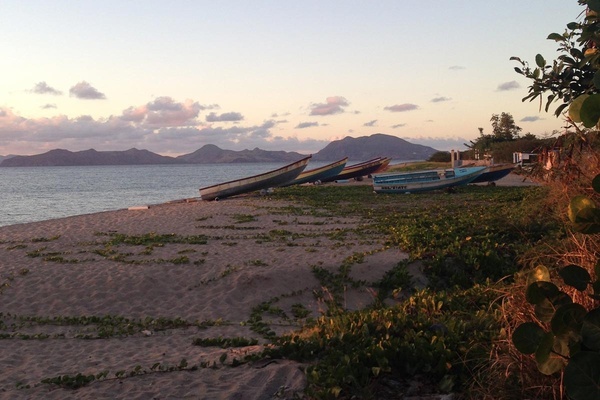 If you're too lazy to leave the confines of the resort — and Nevis, which is barely 35 square miles, is worth touring; the most notable sites being Alexander Hamilton's birthplace in the capital city of Charlestown, and Golden Rock, Brice Marden's stunning boutique inn and restaurant, as well a few hot springs fueled by the dormant volcano that formed the Peak — lunch is best had at a "secret" al fresco spot at the far end of the beach, where a chef grills fresh-caught spiny lobster and pairs it with coconut slaw, fresh mango chutney and curry potato salad that will make you want to put your apartment on the market and move here forever. The kids will want more rice and peas ("they're beans, not peas, mom," says one of the children, not versed in the local idiom). Though this is indeed the place to eat, the Four Seasons Nevis knows that vacationing youngsters are often starving and impatient, a toxic mix, and thus provides the only all-kids buffet I have ever seen, a surfeit of hot dogs, mac and cheese, and marshmallows, where mostly well-behaved munchkins can dine with new friends at Lilliputian tables and chairs. When a post-lunch nap was in order, we dropped the rug rats at Kids for All Seasons, the Four Season's well-programmed camp. You don't have to sign up a week in advance. You don't have to pay extra unless it is a special event. The facility is new and clean. The staff is lovely. Dinner and a Movie was a big hit with our daughter. She watched Rio for the fiftieth time. We ate in peace. There's also a weekly "Drive-In" movie, cleverly held on the driving range. Check the posted weekly schedule to entice your brood. Wow! A crab hunt on the beach! A conga party! Storytelling under the swaying palms! This is a place that spells your kids names out in miniature sponge letters and welcomes them with stuffed turtles when you enter your room. This is a place that has a professional doctor and nurse on staff 24/7, which helps when your father-in-law thinks your daughter's stomachache might be appendicitis. Kids are skillfully managed here, and kids are contained, a feat much easier said than done, which is likely welcome for those less interested in seeing too much of other people's offspring. For the grownups, pampering begins in the morning when you attempt to pour your own coffee. This will not be allowed. 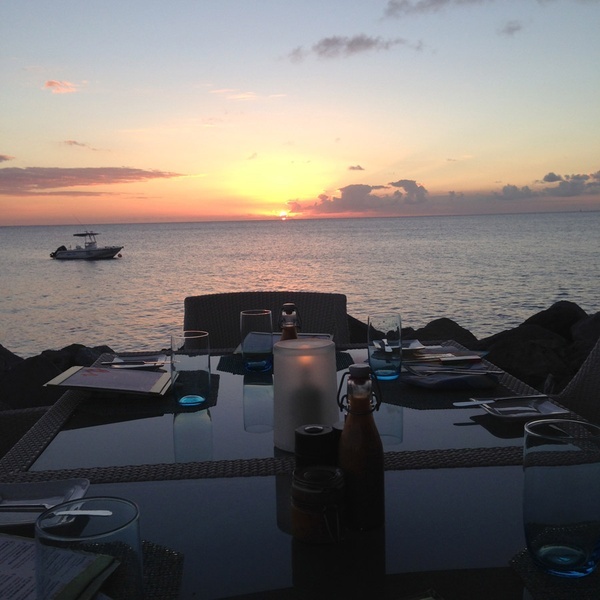 You will tell yourself that you will order a la carte, then head to the heroically stocked breakfast buffet. There you will find every imaginable dish, familiar and local. No need to worry about the calorie count of, say, a fried pineapple fritter, because the gym is very nice, if you're that kind of person, the golf course even better, and the tennis courts excellent. But if you prefer to live like a Roman and eschew all activity (my kind of person), you will find the beach chairs commendably comfortable. And, unlike a million other inferior resorts during the height of spring break, you will not have to mark your territory on the beach with a book at 6 a.m. For something a little more special, individual beach cabanas can be rented by the day right on the water. And, if you aren't relaxed enough, the obligatory world-class spa awaits with every imaginable indulgence and emollient. Seafarers can book a variety of adventures right off the Four Seasons pier. No driving, no hassle, no crowds. My wife hates booze-cruise outings, but she reluctantly agreed to join the boy and me on a catamaran sail to a lovely secluded spot for a few hours of amazing snorkeling (and more rum punch). It was the first boat trip in years that she actually enjoyed and not merely endured. Blissfully, we were the only vessel anchored at the cove. You can also book an amateur fishing adventure and have your catch grilled for dinner. Scuba diving is off the hizzle. But the thing I may have found most charming, or certainly least expected, was our moment with the monkeys. The hotel offers a cart-driven tour of the massive golf course, which extends into the rolling foothills of Nevis Peak. I don't actually play golf, but this happens to be how you get to see the wild creatures that make this island even more magical. Here, at the border of the rain forest, live thousands of Vervet monkeys, imported two centuries ago, an unfortunate legacy of the slave trade. We were passing along a switchback when we came face-to-face with a troop of about thirty of these expressive, oddly humanoid creatures — so human that the species often suffers from anxiety and, in certain instances, alcoholism, which makes them even more relatable. They starred back at us like stunned fellow travelers. Our crew was able to inch so close we could smell them, but not close enough to be bothersome or dangerous. The moment held for about sixty perfect seconds. Then, with a look of bemused disapproval — for the human family on vacation can be a motley crew — they moved elegantly back into the bush. Fly: Robert L. Bradshaw International Airport (SKB) is the international airport on St. Kitts. From the United States, American Airlines flies non-stop daily from Miami International Airport (MIA) and a few days per week from John F. Kennedy International Airport (JFK) in New York City. Delta and US Airways fly weekly from Atlanta (ATL), and Charlotte (CLT). From the United Kingdom and Europe, British Airways flies direct flights from London Gatwick Airport (LGW). It's true. Here's a BBC Worldwide clip about them. Andrew Essex is CEO of Droga5, the award-winning advertising agency. You can follow him @andrewessex. He travels mostly for business but always for pleasure.